Dismiss Your Ticket. Over 100,000 Dismissed! Free Certificate Delivery to DMV or to You. 6. We Notify the DMV. Costs Only $10. Accepted by DMV & All Courts in Missouri. Unlimited Retakes. We know traffic tickets are expensive. We promise you an easy, cheap and fast online Driver Improvement Course. We also report your completion to Missouri State. We are a national company that is licensed in several states including the Great State of Missouri. 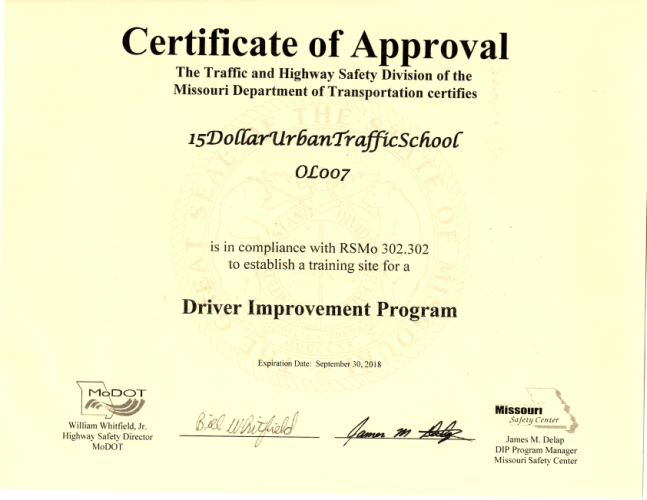 Our course is licensed by Missouri Department of Motor Vehicles. We kept our course self paced. Our website is available 24/7. You can Log in and out of the online course as many times as you'd like! We save your progress automatically. Your happiness is EVERYTHING to us. Almost all of our prior students recommend Urban Traffic School to a friend. We will give you a full refund if you're not happy with us. We made our course as simple as possible. With only few chapters to study and having practice quizzes, you will complete the course in no time. We guarantee you will pass our course or we will give you a free course retake. We thrive to provide our students 100% satisfaction that they deserve. The following counties have authorized the Fine Collection Center (FCC) to approve attendance at the Driver Improvement Program to avoid point assessment on a Missouri Driver’s License for moving violations. The name of the county where you received your ticket is found on the top of your citation in the first block. If the county in which you received your citation is not listed above and you want to attend the Driver Improvement Program, you must first plead not guilty to the Fine Collection Center. FCC will then send your citation to the prosecuting attorney in the county where the citation was issued. After the prosecutor files the citation with the court, the court will notify you of a court date. If you plead guilty at the court, the court has the authority to allow you to attend DIP to avoid point assessment. However, this decision is made by the court on a case by case basis and there is no guarantee that the court will allow you to attend DIP to avoid points on your driver’s license. You should check with the court in the county where the ticket was issued to learn about local policies concerning DIP. An online course at Urban Traffic School is simple to follow, fun to read and easy to pass. Our final exam is 50 questions and contains common knowledge driving techniques. Moreover, you have unlimited tries to pass the final exam. We have over 99% success rate with our final exams. Points on a driving record can be costly! Your vehicle insurance premiums may skyrocket for three years due to points assessed on your driving record. Taking an authorized and licensed online Driver Improvement Program (DIP) Course such as the one we offer can help prevent your insurance from being raised.